Paris, London, New York, Tokyo, Phoenixville. Though it may not be Paris, Phoenixville changes enough over time to merit the Hemingway book title. We’ve visited and revisited Phoenixville over the years, each time surprised and charmed by the changes. 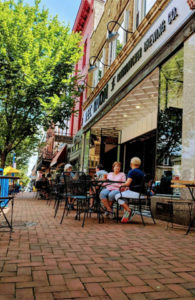 Once known as the home of substantial iron works and Majolica pottery, the town survived tough times to become today a revitalized community that’s both burgeoning bedroom suburb and brewery capital of Pennsylvania. 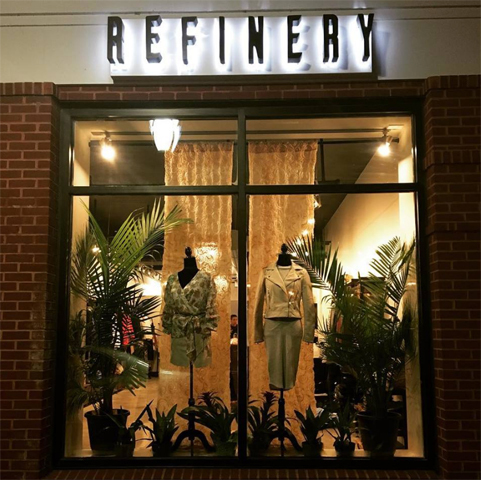 Walk along Bridge Street and find a new chef-driven BYOB, trendy boutiques, art studios, cycle shops, co-working spaces and new apartment buildings for commuting professionals and empty nesters. Slow down and you’ll spot banners announcing new businesses “coming soon,” along with the latest additions to Phoenixville’s restaurant row and brewpub options. We’ll tour a few of our new finds, with passing references to old faves. And given the ever-expanding ranks of breweries, taprooms, bottleshops and spots to sip wine and spirits, we’ve included a Guide to Beer in Phoenixville for your next visit. Yes, Majolica, a top choice for destination dining, still anchors the west end of Bridge Street. And there are plenty of other popular choices in town, like Thai L’Elephant, Black Lab Bistro, Franco Ristorante, the Great American Pub and more. But if you have an appetite for something new, read on. 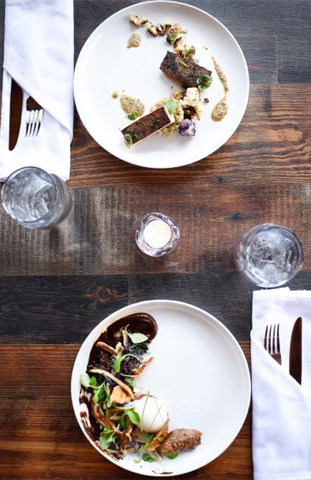 New on the scene is Louette’s BYO, at the east end of Bridge Street in Marly’s former space. Chef/owner Steve Howells, with stints around the country including some Michelin-starred spots and Blackfish in Conshy, is cooking up imaginative, eclectic, seasonal fare. With tasting menu categories—Simple, Noodles, Conversation Starters, More Like Mains—he creates small plates (not tapas) for spirited grazing. Try harissa noodles with poached egg and crispy potato skins or Spanish mackerel crudo with horseradish crème fraiche, lemon, chives, radish and crispy shallots. In short: an upscale option with quality ingredients, carefully prepared and artistically presented at a comfortable price point. Now some options for different tastes. If it’s a truth universally acknowledged that everything tastes better with bacon, then you must visit Bacon Me Crazy, where the pork products are farm raised and fed a veggie diet. Check out treats like bacon wrapped mozzarella sticks, jalapeño and bacon mac & cheese, bacon and blue cheese fries, bacon burgers, BLTs and a bacon sampler—a flight of bacon with three varieties for tasting. Serving breakfast and lunch, with a market and some late-night hours. Since jerky goes well with craft beer, the official drink of Phoenixville, how lucky there’s a House of Jerky on Main Street. Choose jerky made from beef, buffalo, venison, kangaroo, pork, turkey, fish and more, made the old-fashioned way—not ground, chopped, processed or formed into strips and without preservatives, MSG or artificial color. Stop in and chew the … jerky, or order online. Make sure to get your jerky points for frequent buyers. It’s meat candy of the gods. Our next point of interest spans eating and drinking. Sedona Taphouse is a national chain with over ten locations that plans to open its first PA spot in Phoenixville in the next few months. Bringing its impressive craft beer list (a “World Class” rating by Beer Advocate), along with extensive wine list and creative cocktails, this upscale comfort food taphouse serves brunch, lunch and dinner. There’s a community-focused philosophy offering discounts to firefighters, police officers, military members, teachers and nurses. A newish addition to the many places to quaff a brew, The Rec Room serves up Conshohocken Brewing Company’s beer—brewed in small batches of uniquely crafted, innovative, fresh, quality beers. Try a Type A IPA, East Elm Street Pumpkin Ale along with bites from their classic bar menu or bottomless beer-mosas at brunch. 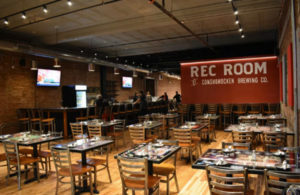 Situated directly across from the Colonial Theatre on Bridge Street and conceived as a hang-out place, the aptly titled Rec Room touts “great beer, great food and a great time,” which explains the ping pong tables, shuffleboard tables and a foosball table. Conshohocken Brewing has a taproom, brewpub and town tap at other locations. 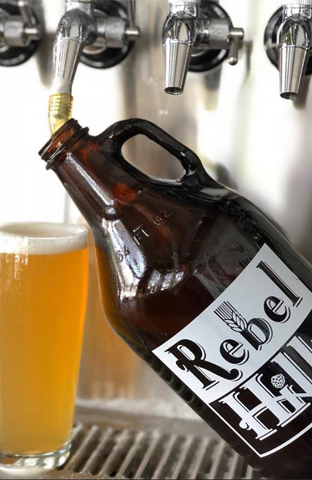 On the outskirts of Phoenixville, Rebel Hill Brewing Company focuses on beer—you can BYOF (bring your own food)—at this seven-barrel brewery specializing in IPAs, pale ales, saisons and stouts yet offering more choices, including cider and wines from other sources. The husband-and-wife team opened Rebel Hill in March, with the intent to offer “something a bit rebellious.” They’re also inventive, like aging some Cutting Teeth milk stout in a Dad’s Hat rye whiskey barrel. Proximity to Uncle B’s BBQ Shack is a plus! Bistro on Bridge has been a destination drinking spot in Phoenixville since 2009. But this year it reinvented itself. Downstairs is a new 32-foot bar with 30+ beers on tap, along with wine and cocktails. You’ll find a welcoming space with communal tables and an eye-catching beer-tap-handle chandelier (you need to see it). But upstairs is the real magic. The second-floor Analog Room, a rooftop open-air beer garden, features retro arcade games, fireplace, refurbished shuffle board table, vintage cocktails and live music. It’s impossible to miss the iconic VW Beer Bus/converted bar, serving brews from Ballast Point Brewing Company. For wine fans, a “coming soon” banner in the street-level space of Phoenix Village announces Vintner’s Table by Folino Estate Winery of Kutztown, promising a gift shop, tasting room and salumeria. Stay tuned. 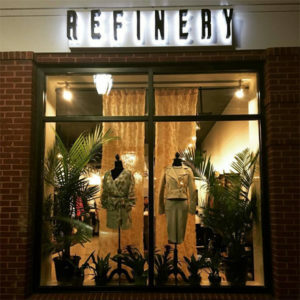 For fashion mavens, there’s Refinery, where you can “refine your style to become the trend.” Owners Kelly Miller and Lisa O’Neill curate clothing brands for their ideal clients—“fun, creative, motivated and independent women who demand and command style.” Best line on their hip website: “When a Refinery Woman walks into a room, records scratch, heads turn and jaws drop.” A fashion show fundraiser for The House, a local women’s outreach center, is planned for November 2. For the DIYers out there, 3 Painted Pugs is a “proud stockiest” of chalk paint by Annie Sloan, along with General Finishes and The Real Milk Paint Co. paints and accessories. They also host workshops, group sessions and individual tutorials with their paints. Stop in the shop to see repurposed and upcycled furniture and hear more about custom refinishing services. 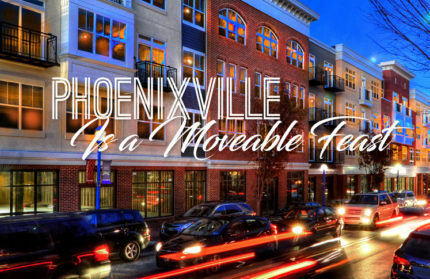 Keep current with ever-changing Phoenixville by following Phoenixville First, PXVFirst. Six breweries currently call Phoenixville their home—from old timers like Iron Hill, Sly Fox and Stable 12, to newcomers Crowded Castle, Root Down and Rebel Hill Brewing Companies—along with even more places in nearby towns. In addition to breweries, you’ll find bottleshops and taprooms like Bistro on Bridge and the Rec Room. Plus Bluebird Distillery and wine bars in town. Here’s a quick guide to finding craft beer on your next visit. Appalachian Brewing Company Hand-crafted ales and lagers in a friendly brewpub in Collegeville. 50 West 3rd Ave. & Chestnut St. ABCBrew.com/team/Collegeville. Crowded Castle Brewing Company Crafting unique beers, their specialties include IPAs, ales, porters and stouts. While they do offer a tasty small-bites menu, you can bring you own food (BYOF) or have it delivered from a local restaurant. 240-242 Bridge St. CrowdedCastle.com. Iron Hill Brewery For over 20 years, their craft beers and handcrafted foods inspire one another in unexpected ways. Try one of their signature beers, beers on tap or bottled reserves. 130 Bridge St. IronHillBrewery.com. Rebel Hill Brewing Company Recently opened outside downtown, this 7-barrel brewhouse specializes in craft beer styles such as IPA, pale ale, saison and stout. It’s BYOF with plenty of local options. 420 Schuylkill Rd. RebelHillBrewing.com. Root Down Brewing Company Vaulted ceilings with wood beams in a huge space formerly used for brewing … root beer. Great beer and food menus, including some wine and ciders. 1 N. Main St. RootDownBrewing.com. Sly Fox Brewhouse & Eatery Founded in 1995, it’s one of the oldest brewpubs operating in the Delaware Valley. They have a national reputation in the world of craft brewing. 520 Kimberton Rd. SlyFoxBeer.com. Stable 12 Brewery A collaboration of three beer-loving best friends with a new hobby, focusing on what they love … beer. Try a Farmer’s Tan, Sugar Coated Pony Kisses IPA or Razzle Dazzle Witbier. 368 Bridge St. Stable12.com. Stickman Brews Located in Royersford and focusing on American twists of Belgian-inspired beers with something new offered all the time. 326 N. Lewis Rd. #240 (back of the strip mall), Royersford. StickmanBrews.com. Tuned Up Brewing Company Find them in Spring City, serving up treats such as Raspberry Acid Freakout Fruit Beer, Scorned Woman IPA and Big Booty Stout. Music and food trucks are an added bonus. 135 N. Main St., Spring City. On Facebook. Bistro on Bridge Newly renovated taproom has a creative layout and inventive food. Serving beer out of a vintage VW bus-styled bar alongside a retro arcade in the roof-top Analog Lounge. 208-212 Bridge St. BistroOnBridge.com. The Foodery Beers from around the world in the cooler plus more beers, wines and kombucha on tap. Deli menu. 325 Bridge St. FooderyBeer.com. Sedona Taproom Coming soon. Extensive craft beer line up, plus wine, spirits, food. 131 Bridge St. SedonaTaphouse.com. Thirty food trucks plus other vendors. Main & Bridge Sts. Free parking with free shuttle. Noon to 6 pm. PhoenixvilleFoodFestival.com. Entertainment, food, family selfie booth, scarecrow contest and prizes. Reeves Park, 2nd Ave., 9 to 3. KidsfestPhoenixville.blogspot.com. Point Entertainment Presents: Oct. 12, Los Lobos; Oct. 14, Al Stewart and The Empty Pockets; Oct. 25, Gaelic Storm; Nov. 9, Found Footage Festival hosts Joe Pickett and Nick Prueher. 227 Bridge St. 610-917-1228; TheColonialTheatre.com. Fun for all ages, Oompah music, great food, Bavarian pretzels, lots of beer. 400 Jacobs St., Mont Clare. PhoenixvilleOktoberfest.com. Oct. 20, Pumpkinfest—derby races, “best” pumpkin dish. Main St. 10:30 to 4. 484-928-0562; PhoenixvillePumpkinFest.com. Oct. 24, Halloween Parade begins at 300 Block of Bridge St. & Taylor Alley, 7 pm. Rain date, Oct 26. 610-933-8801; Phoenixville.org. Oct. 28, Halloween Silent Movie, “The Golem” with Wayne Zimmerman; Nov. 18, concert with David Wickerham; Dec. 9, Holiday Concert. The Colonial Theatre, 227 Bridge St. 2 pm. $5–$10. 610-917-1228; TOSDV.org. Fun all weekend long: night market on Thursday, then a craft carnival, movie in Reeves Park, beer garden, pet parade and pet day, pop-up garden and more. Held throughout town. Info at PhoenixvilleHarvestFestival.com. Buy a simple meal of soup and bread served in a bowl handcrafted by an area artist and help fight hunger. Benefits PACS. Technical College High School, Pickering Campus, Charlestown Rd. 5 to 8. $25. 610-933-1105; PACSPhx.org. Part of the Harvest Festival, this super fun, family-friendly event benefits groups providing shelter for the homeless. PXVBedRaces.org. The annual library benefit. Wine tasting, dinner, silent auction and guest speakers Lisa Scottoline & Francesca Serritella. Rivercrest Golf Club & Preserve, 100 Golf Club Dr. 5:45 to 9. $90–$125. 610-933-3013; PhoenixvilleLibrary.org. Dinner, dancing and silent auction with great items. Benefits the Senior Center. Phoenixville Country Club, 355 Country Club Rd. 5:30. $90. 610-933-3070; PhoenixvilleChamber.org. Decorated homes and churches, crafts, music, refreshments. Benefits Ann’s Heart Code Blue Shelter and Firebird Theatre. $25. 3 to 7. Details 610-933-9181; PhxHolidayTour.weebly.com. Parade starts at 7 from the 300 block of Bridge St., then on to tree lighting at Bridge & Main Sts. 8 pm. 610-933-3070; Phoenixville.org. Burning of the Firebird at Veteran’s Park, 192 Mowere Rd. Starts at 3, burning of the Phoenix at 8:15. 610-933-9199; FirebirdFestival.com. A premier food, wine, beer event. Live music. Benefits the Good Samaritan Shelter. Franklin Commons, 400 Franklin Ave. $100. 6 to 10. 610-933-9305; TasteOfPhoenixville.com.